Summer is such a great time of year. The sun is shining, the temperature is hot, and this is the perfect mixture that allows all of us who love the outdoors to go out and do the things we love. There is no better place to go do these things than in the Uintas. Utah is known for many things, and these mountains are one of them. For those of us who grew up just two interstates and a few town roads away, we know the beauty of this place. It is filled with a variety of wildlife, pristine camping, a small army of mosquitos, and lakes with great fishing opportunities. And these ingredients are what made this last weekend awesome for me. The entire drive up my head was wrapped around the idea of fishing. I warned my mom that as soon as I got there I wanted to head out to the lake. I had a whole plan in mind to get everything unpacked quickly to make sure we would have pl enty of time on the lake. I arrived a little after 11 in the morning, which isn’t an ideal time to catch a fish, but I didn’t care and after five minutes of being at camp I was ready with my pole in one hand, tackle box in the other, ready to go. Needless to say my fishing weekend was a success. I caught he first fish on my first cast. Now that’s skill, or horribly good luck (I’m going to go with skill). After the catch I continued being teased with nibbles until I caught two more after him. I was stoked I didn’t know how to contain myself. These three Brook Trouts were the highlight of my weekend. I kept thinking to myself that when I was younger my parents used to give us kids a dollar for the first catch, biggest catch, and the most catches… All these years later and I’m still thinking about collecting those dollars. Fishing does that. It’s what many of us do to unwind, think, not think, enjoy the company of others, or to just be by ourselves. Check out Tread Lightly’s! fishing recreation tips to learn more about fishing responsibly! The outdoors is a place that I have always called home. It’s a place where I get to escape to whenever the noise of a busy city and a busy mind starts to deplete my appreciation of the world around me. It is my way to kick back and restart my mind when drinking coffee and reading a book just doesn’t work. My favorite childhood memories are the ones of my mom teaching me how to cast a line into Brownie Lake, my grandparents teaching me how to drive a Honda Rubicon in Irish Canyon, and my ski instructor Steve telling me to “PIZZA!” when all I really wanted to do was “French Fry”. These are all factors that made me who I am and why I chose to go down a path that involves outdoor recreation. So what better way to wrap up a college education than with an internship with Tread Lightly!? In school I have read multiple textbooks, looked at so many PowerPoint’s, and listened to an endless amount of instructors tell me about how people put value on the outdoors. And that is why it is important to help others understand that we need to take care of these places so everyone can enjoy them. There are a plethora of tools out there that help educate people on what it means to recreate responsibly so these valued places can remain in tact. I think Tread Lightly! is one of the best tools anyone can use. I recently practiced one of Tread Lightly!’s five principles; do your part. 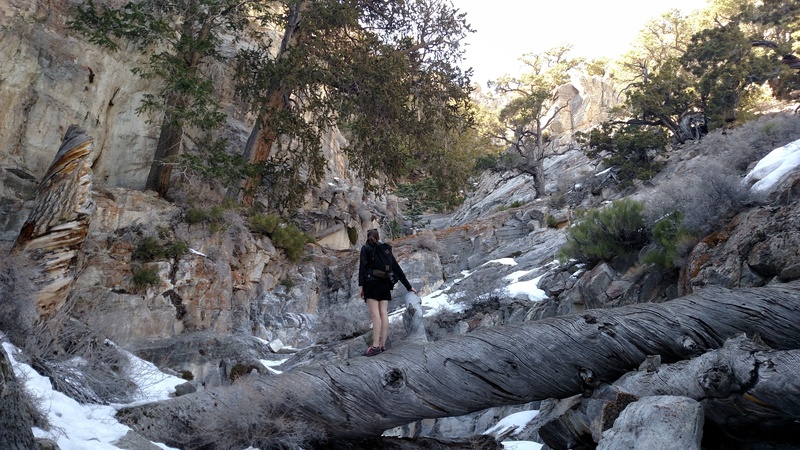 I went on a hike in the West Desert with a few of my friends a few weeks ago. It was strenuous route we picked. And as we were moving up the trail I noticed wrappers on and off all along the side of where we were walking. I kept picking them up and putting them in my pack. About five miles up my friend asked me why I kept stopping to pick up all this garbage. I told her, “Because garbage is trashy. Hahaha.” It sparked a discussion about how trash changes the aesthetic value of our favorite hiking trails and I asked them if they would be willing to do something and help clean up. They didn’t like the thought of it at first, but the more we talked the more they agreed they would. By the end of the day the trail looked better coming down than going up. I am so close to graduating from the University of Utah. I just need to complete an internship and then I am done! So, I chose to, once again, intern with Tread Lightly!. This summer, I will be focusing on working with the Stewardship and Education Department. One of my goals this summer is to work with Tread Lightly! at their outreach events. From the first event, I can tell that I am in for an adventure this summer. Tread Lightly! reaches out to organizations who are putting on events that involve the outdoors and the outdoor community. Some of the events that Tread Lightly! has attended are Rally on the Rocks, the Easter Jeep Safari and Boy Scout Jamborees. The hope is that we can spread the message of responsible recreation and how it is important to take care of our favorite recreational areas. This weekend, Tread Lightly! 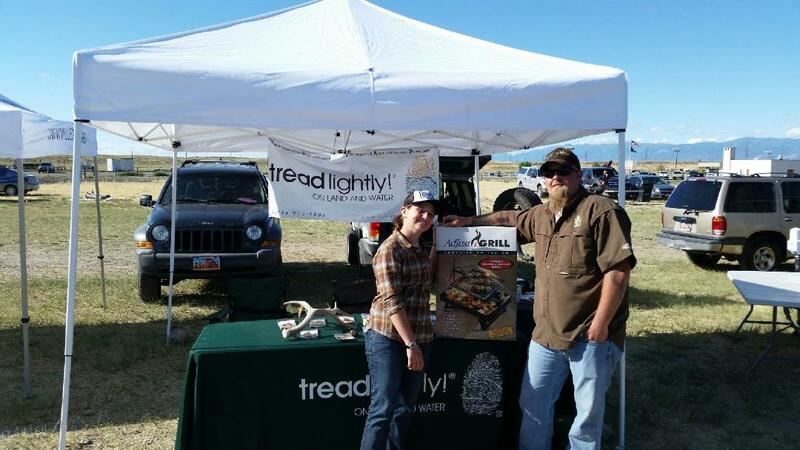 had the opportunity to have a booth at The Outdoor Adventure Days at the Lee Kay Public Shooting Center in Magna, Utah. As an intern, I was invited to see the behind the scenes work of putting a booth together. Outdoor Adventure Days is a free event that the Utah Division of Natural Resources plans to host annually. This year, it was held June 13th to June 14th for the first time. This event included many activities such as archery, target shooting, fishing, ATV riding, bird shows and more. I was excited to be part of it. I was thrilled to work beside Evan, the Programs Manager at Tread Lightly!. As anyone who has met him knows, he has a positive attitude that encourages anyone to have a good time. Our plan was to set up on Thursday so that we could be ready for the event on Friday morning. We drove out there and set up our sunshade. Luckily, we did not set out any of the brochures or posters or banners. During the night, the wind had picked up and blew our sunshade several yards. As the eager intern, I arrived to the Lee Kay Shooting Center earlier than Evan, who had warned me that our shade might need a little work. I drove up to where we had left our sunshade to find an empty patch of ground. After asking several people if they knew where it had gone, I was pointed towards an open field. There, I could see the sunshade and its frame leaning against a wire fence. “A little work” was an understatement. The frame was so bent that it would not extend to its full height and the shade leaned to one side. I decided that we should probably retire it. Luckily, the DNR had brought extra sunshades and they were able to lend us one and save the day. So once Evan arrived and the booth was set up, we were ready to start the day. We had several visitors who were interested in our message and mission. It was a great experience to practice talking to people. Most were hunters and some were fishers and some were kids that were dragged to the fair by their parents. But all were outdoor enthusiast who shared an interest in responsible recreation. I was able to walk around the fair and meet the other vendors. I talked to several, including The Mule Deer Foundation who was the title sponsor for the event. I also spoke to Safari Club international, Hoyt Archery, Earth Wings, and Delta Water Wings. These are all organizations that were out there to spread the message of recreating in the outdoors. Tread Lightly! also gave away an Adjust-A-Grill to one of our visitors who signed up as a friend of Tread Lightly! Despite the wind, I really enjoyed my first recreational outreach event. I could see the success of Outdoor Adventure Days and I really hope that it will be there next year so that I can attend with my friends and family. You’ve heard it in the news, this summer/wildfire season is on track to potentially be the worst season on record. With that in mind, Tread Lightly! wants to encourage all recreationists and specifically target shooters and hunters to do their part to help prevent wildfires. The first step to responsible shooting is Educating Yourself. Here are a few tips on responsible target shooting to help keep you safe and prevent any potential wildfires starts in this dry and hot summer season environment. Know before you go! Many Forest Service and Bureau of Land Management areas are already under fire restrictions. Call your local land manager office or do a simple search online. Restrictions are easy to find by state. Under fire restriction, discharging a firearm, except while engaged in a lawful hunt is prohibited. Shooting of tracer rounds or exploding targets is prohibited on federal public lands in year-round. Consider the type of ammunition and targets you are using. Minimize the risk of fires by not using steel jacketed ammunition, ammunition with steel-core components. Remember that cars and ATVs can have extremely hot exhaust systems that could ignite dry vegetation so drive only on designated routes and park only in designated areas. Travel smart and use spark arrestors to minimize this risk. As our friend Smokey Bear has been reminding us for years… “Only YOU can prevent Wildfires,” and being aware and vigilant is the first step. Here are some additional resources for you to utilize this season. Make sure you spread the word! With all the news and social media activity surrounding tomorrow’s planned ATV protest ride in Utah’s Recapture Canyon, we wanted to remind you that this type of illegal activity is not in keeping with Tread Lightly!’s core principles. Modeling respectful and responsible behaviors is one of the best ways to protect our access to public lands. Importantly, you should only RIDE ON routes designated as open to your mode of transporation and at this time Recapture Canyon is not one of those routes. Saturday’s planned events do not fall into the category of responsible behavior and could do more to limit access in the future than to open up more routes for responsible riders. The news surrounding this event is also detrimental to the OHV community’s image and not what we need after all the headway OHV groups have made to maintain existing motorized routes. So, please, revist Tread Lightly!’s principles below, and share them with your friends and colleagues. You can also visit Tread Lightly!’s website to find a wide variety of brochures providing practical tips on how to recreate responsibly whether on land or water. Have a fun, safe weekend out there and please tread lightly, ride only on designated routes and remember, respected access is open access. Travel Responsibly on land by staying on designated road, trails and areas. Go over, not around, obstacles to avoid widening the trails. Cross streams only at designated fords. When possible, avoid wet, muddy trails. On water, stay on designated waterways and launch your watercraft in a designated area. Avoid Sensitive Areas on land such as meadows, lake shores, wetlands and streams. Stay on designated routes. this protects wildlife habitats and sensitive soils from damage. Don’t disturb historical, archeological or paleontological sites. On water, avoid operating your watercraft in shallow waters or near shorelines at high speeds. Do Your Part by modeling appropriate behavior, leaving the area better than you found it, properly disposing of waste, minmizing the use of fire, avoiding the spread of invasive species and repairing degraded areas. Moab, Utah is a small town in a nest of red rock. The main street hosts a slew of small restaurants, bars, and souvenir shops. It seems you can point in any direction and find some kind of hiking, mountain biking or four wheeling trail to enjoy. If you’re a Jeep enthusiast, you already know all about the town. This was my very first trip to Moab. As a native Utahn, this seems to be somewhat of a controversial point. Lucky for me, I was able to join the rest of the Tread Lightly! 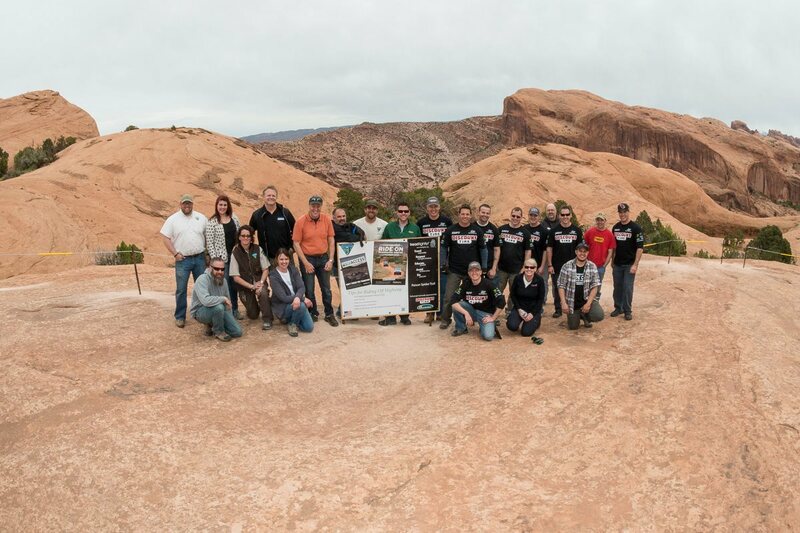 team and see what Moab is about during the Easter Jeep Safari. The main event for Tread Lightly! 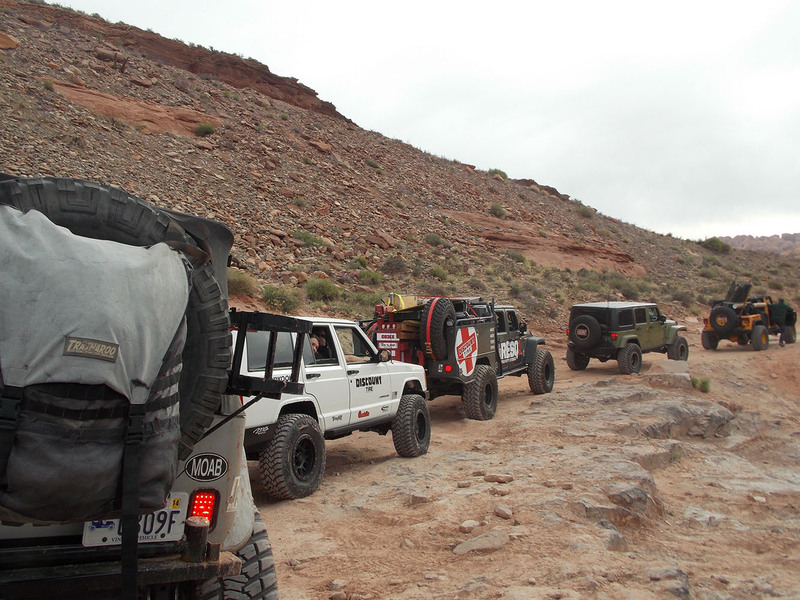 during EJS was our Restoration for Recreation project on the Poison Spider Mesa Trail. Thanks to the direction of the Moab Bureau of Land Management, and funding/volunteers from Discount Tire and Quadratec, this event was a huge success. The day started in the parking lot of the Village Market (big shout out to Cathy in the Deli department for making our lunches for the day). As people arrived, we reviewed the trail, hopped in a rig and headed to the trail head. There, we loaded up the vehicles and then hit the trail. The Discount Tire RESQ1 lead the pack through the trail. Along the way we hit a variety of obstacles and each Jeep took it’s turn. It was a great day of fun that was peppered with some hard work from our dedicated team. Little Arch was our first destination. The team dispersed, grabbed a tool and got to work. During the day we built three fences to help keep vehicles on the trail for safety and to protect designated wilderness areas. After a long day of drilling, welding and setting posts, the teams headed back to the trail head. This definitely beats a day at the office. I don’t know about you, but I am excited for spring! It’s time to finally get outside and enjoy our favorite activities! Life just begins again in the springtime. 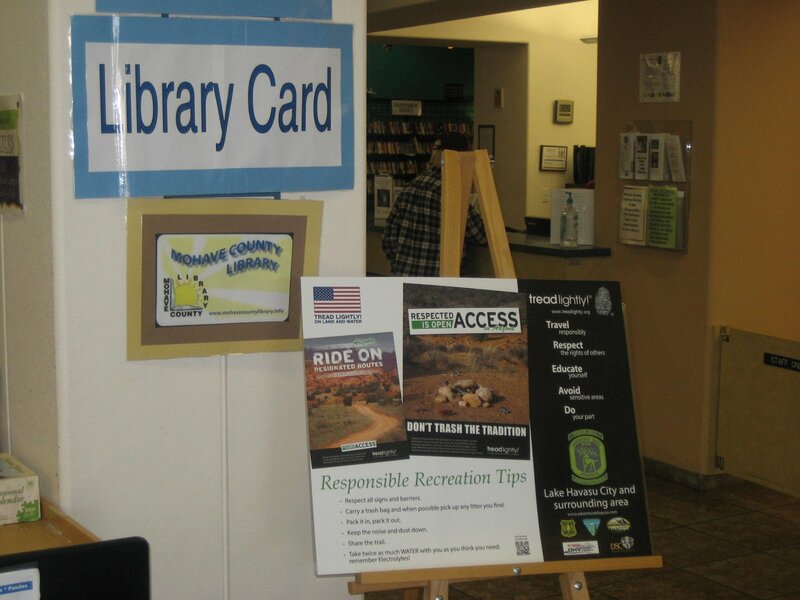 People are happier, more motivated and looking for activities to promote responsible recreation and preservation of our favorite recreation areas. I would like to give a shout out to one group who is dedicated to enjoying the outdoors with their dogs. Happy Feet Adventure Dogs is a group of humans and their dogs looking to get the best out of the world around us. They are one pack out of a national organization called, Adventure Dogs USA. They work to promote doggie socializing while learning. The pack participates in Hiking, Walks, Fun Obstacles, Trick Training, Parades, Water Sports: Kayak, Paddleboard, Swimming, Doggie Water Rescue. Along with supporting healthy lives for their dogs, the group actively supports Rescue & Shelters at Community Events and support Parks. 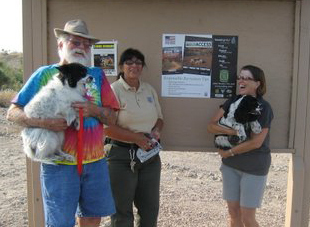 Happy Feet Adventure Dogs even participates in public land cleanup days, including; river, beach, trail & Waterways cleanups. 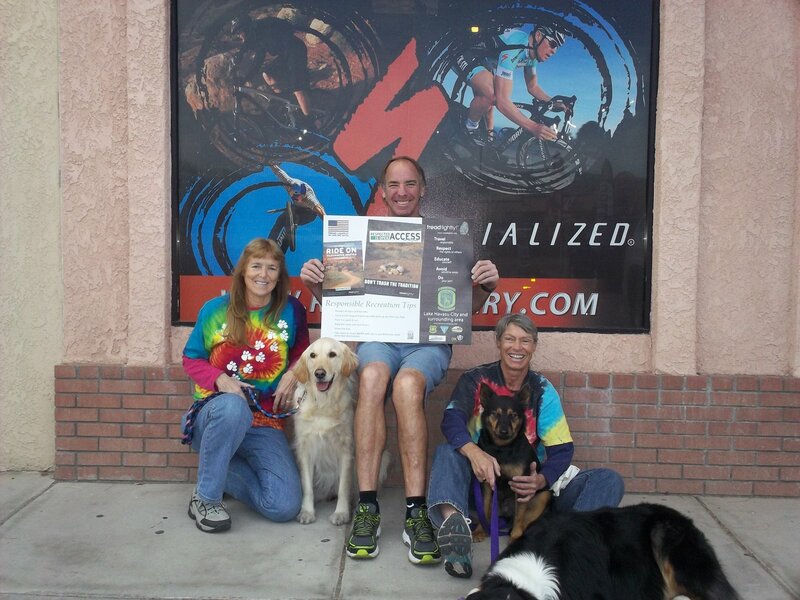 Last month, their Pack went around Lake Havasu City and placed several of Tread Lightly!’s educational posters in local libraries, bike shops, and trail heads. 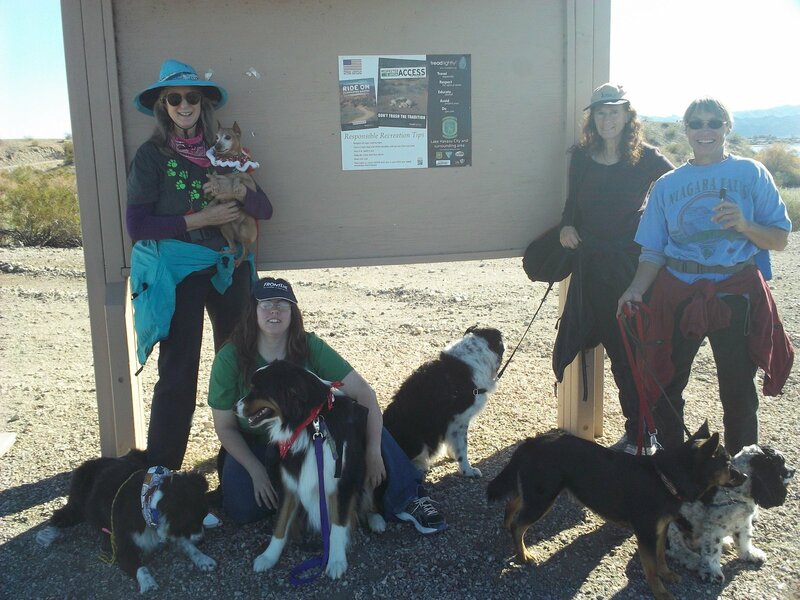 Members of their pack are very active in supporting Trails of all kinds and have worked with Lake Havasu City, BLM, State Parks and many Community Events and Activities on Public Trails and Pathways. They were very creative when they thought to go to local bike shops. Not only are the owners of the bike shops active trail users but each are very active promoters of protecting and building trails. Each have donated countless hours of hard work on public lands and trails and continue to do so; as do their families and employees. This pack has been instrumental in working with multi-users on Trails and Pathways and working to coordinate with getting donation money for Trail Markings and Signage. Their group does not fundraise. Instead, they volunteer their time and energy to working and partnering with city, BLM, state and community non-profit groups on concentrating their efforts. The staff of Tread Lightly! would like to give a special thanks to Sue Wolfe & “Joey”, Tina Upton “Fifi” & “Hogan”, Lucy Vinsik, “Molly” & “Chico”. Judy, Bob & “Bean” Zarda, Vicki Warner, “Black Bart”, “Josephine”, Rose Kopecky & “Chloe”, MJ, Ali & “Healer”, Sandy Walters & “Dakota”, Maria, Nurya & “Onyx” Lourdes, Vanessa Irving & “Jax”. You sound like an awesome pack of very unique individuals and we love that you can have fun while dedicating yourselves to local trails and recreation areas. We hope that our posters are beneficial in keeping your local trails clean and enjoyable for everyone!